A portal is an aperture in the fabric of space through which exotic matter is emitted into our world. 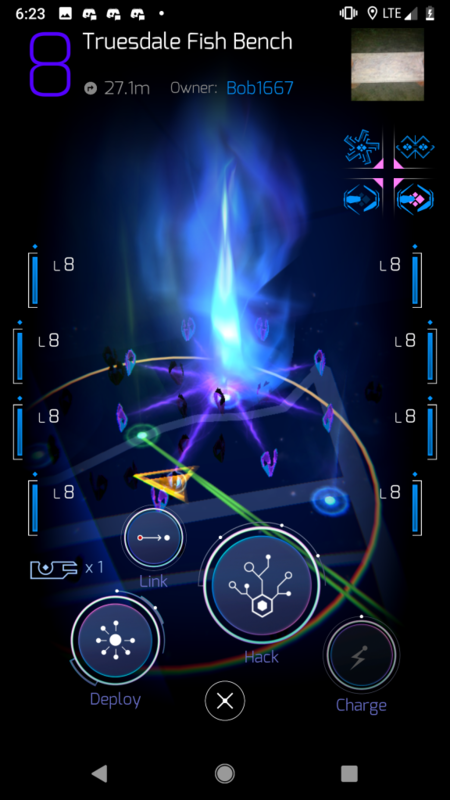 Ingress gameplay revolves around control of portals. Portals appear in the scanner as glowing fountains. Neutral (uncaptured) portals are small and grey. When an agent captures a portal, it changes to that faction‘s color: green for the Enlightened and blue for the Resistance. As agents upgrade a portal, it will become larger. A portal will periodically generate XM on the ground around itself. The amount of XM generated is 10% of the portal’s current energy level. For example, a fully-charged L8 portal will have 48,000 energy, which means it will generate 4,800 XM on the ground. XM is regenerated every 10-15 minutes or so. Portals have eight slots where agents can deploy resonators. These devices store XM and strengthen the portal. They appear around the portal in the scanner, with a colored beam connecting each one to the portal. The color of the resonator and the color of the connecting beam indicates the resonator’s level. Each slot can accommodate one resonator. When all eight slots are empty, the portal is said to be neutral or uncaptured. Deploying a resonator on a neutral portal captures it, claiming it for your faction. Once all eight slots are occupied by resonators, the portal is said to be fully powered. A portal that is fully powered can be additionally strengthened by replacing existing resonators with ones of higher level; this is called upgrading them. Resonators are destroyed when their XM energy levels are depleted; this can be caused by enemy attacks or natural decay over time. When all resonators on the portal are destroyed, it reverts to neutral status. Burnout Insulation: Increases the number of hacks that can be performed on the portal by a single agent before it burns out. Each unit of burnout insulation increases the number of hacks by one. Burnout insulation is provided by multi-hacks. Force Amplifier: Force amplification multiplies damage from a portal’s counterattack. It is increased by installing force amps. Hack Speed: Indicates a percentage amount by which this portal’s cooldown time has been reduced, allowing you to hack it more quickly. Hack speed is increased by applying heat sinks. For example, a portal with a single very rare heat sink results in a hack speed of 70%, meaning that the portal will cool down in 90 seconds rather than 300. Hit Bonus: The hit bonus results in a portal’s counterattack inflicting increased damage, although the exact mechanism that dictates how this is applied is still uncertain at this time. Hit bonus is increased by installing turrets. Link Defense Boost: Links provide damage mitigation to resonators. A SoftBank ultra link boosts this mitigation by 50%. Outgoing Link Bonus: Normally, a portal can support up to eight outgoing links. SoftBank ultra links add support for another eight outgoing links each. Range: The maximum distance of remote portals to which this portal can be linked. The portal’s range can be increased by deploying or upgrading resonators or installing link amps. Shielding: Shielding contributes to a portal’s mitigation, which reduces the amount of damage incurred by the portal’s resonators when attacked. Note that links also contribute to mitigation, and that the two combined are capped at 95. Adding shields to a portal whose mitigation is already at 95 will not increase it further. However, it may help the portal last longer if another shield is stripped off in an attack. Strike Factor: The strike factor results in a portal’s counterattack inflicting increased damage, although the exact mechanism that dictates how this is applied is still uncertain at this time. Strike factor is increased by installing turrets. XM-Spin: Alters the balance of offensive and defensive items hacked from a portal. Possible values are -1 (more offensive items), 0 (balanced), and 1 (more defensive items). A portal’s spin is altered by installing transmuters. At the top is the title bar, which displays the portal’s name. At the top-left is the portal’s level. Tapping it has the same effect as tapping the portal’s photo (see below). Below the title is the distance to the portal and its current owner (the agent who most recently captured the portal). Tap their name to view their profile or send them a message. To the right is a photo of the portal, if available. Tapping this picture will bring up another screen displaying where you can read its description if it has one, and view all photos of this portal. When you select a photo in the carousel, it is displayed at the top, with the name of the agent that submitted it and the number of likes. Tap the thumbs-up icon to “like” the photo that is currently shown; the main photo for the portal is the that is most liked. Tap the X button to return to the portal information card. Below the photo is a diagram showing the portal’s four mod slots. Tap a slot to bring up the mod status screen, allowing you to see details about the current mods and install more. Occupying the center of the screen is an image of the portal itself. Flanking it are diagrams showing the level and XM charge of each deployed resonator. If a resonator is fully charged, its meter will have a dot above it. When you go into the deploy or charge screens, the names of the agents that deployed each resonator will also be displayed. Below the resonator displays on the left side is an indicator showing the number of keys to this portal that you hold. Deploy: Tap it or swipe up to view the resonator status screen. Swipe diagonally up and right from the deploy button to view the mod status screen. Link: Tap to view the list of portals that you can link to this one. This button will be disabled if you’re not in range of the portal, if it is not controlled by your faction, or if it has any empty resonator slots. Hack: Tap to hack the portal. Swipe diagonally up and left to glyph hack. Swipe up to request a key. Swipe diagonally up and right to request no key. Charge: Tap to bring up the charge screen, or swipe up to boost charge all resonators. Close: Dismiss the portal information card. To the right of the key button is a readout showing the portal’s total energy (XM) level. This is the sum of the energy stored in each resonator. The more energy the portal has, the more damage must be inflicted to neutralize the portal. The name of the portal’s current owner is displayed to the right of the photo and below the title bar. The owner is the agent who most recently captured the portal. You can long press their name to view their profile or send them a message in comm.